When you are on a team with Sidney Crosby, Evgeni Malkin, Kris Letang, and Marc-Andre Fleury, to name a few, it is easy for fans to overlook you. It is also easy for fans to take you for granted. While many fans seem to be just fine with sending Brandon Sutter away for Ryan Kesler, as the old adage goes, 'you don't know what you've got 'til it's gone...' So, while I still have time to do it, I am going to take some time and appreciate Brandon Sutter. 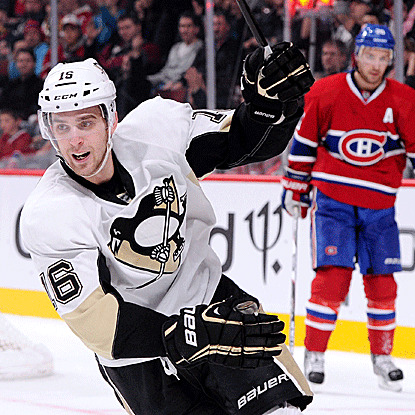 It seems like ever since Brandon Sutter first donned a Pittsburgh Penguins' jersey fans were taking him for granted. He was traded to the Pens in June of 2012 in a deal that sent Jordan Staal to the Hurricanes. Right away Sutter was behind the eight-ball. Staal was drafted by the Penguins and he was certainly a crowd favorite. 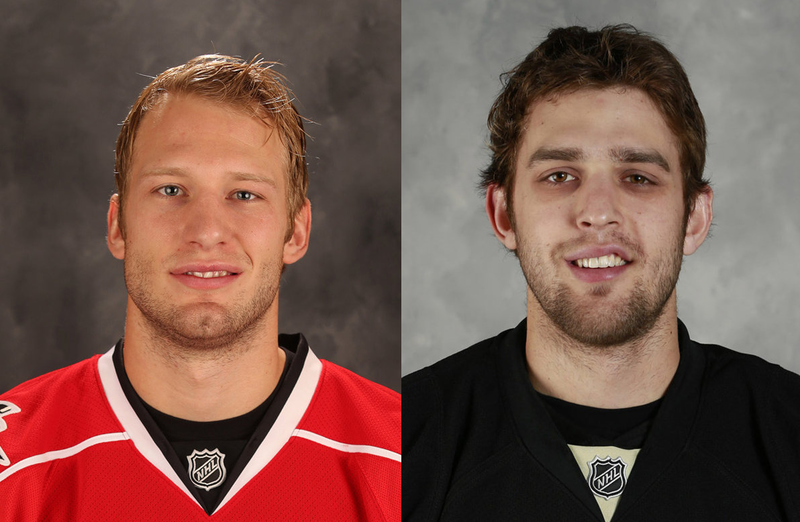 If you asked most fans whether they would rather have Jordan Staal or Brandon Sutter on the third-line, I would guess Staal would win by a landslide... but why? In his first season with the Penguins, Sutter scored 11 goals and 8 assists in 48 games. Staal scored 10 goals and 21 assists with Carolina. Is the extra 12 points worth another $4 mil in valuable cap space? In my eyes, no way. Sutter may be less flashy and less of a shorthanded scoring threat than Staal, but that is pretty much where the dropoff ends. Sutter plays valuable minutes on the 2nd ranked PK unit in the NHL. He also heads the second power play unit for the Penguins. How about this year's totals? Staal has 11 G and 16 A while playing with Alexander Semin and at times his brother, Eric Staal. Sutter has managed 10 goals and 11 assists with wingers such as Chuck Kobasew, Taylor Pyatt, Tanner Glass, Chris Conner, and I could go on. Does the six point difference warrant an extra $4 million? The above image is a current list of all the 3rd line centers in the NHL. Most of the teams have had a consistent 3rd line center for the better part of a season, but there are some teams who have some injuries and currently have some young guys filling in for them. For example, the Tampa Bay Lightning have been decimated with center injuries with Stamkos and Filppula on injured reserve. So, take some of these numbers with a grain of salt. If you look at Brandon Sutter's stats, he shows up right in the middle of the pack in terms of production and cap hit. The things I like about Sutter are that he has managed to stay consistent with his production even though the talent around him has downgraded significantly, and he is relatively young at 25. He is a great two-way hockey player that is only going to get better. If you believe what they say about forwards not fully maturing until their late 20's or early 30's, his best hockey is yet to come. With 663 minutes of even-strength hockey played this season, Sutter has only been on the ice for 16 of the Penguins 104 even strength goals-against. That puts him second behind Vitale at 13 among players who have played at least 40 games. This number also ranks him 16th in the NHL in a group commonly placed in the Selke award consideration. Sutter is allowing 1.56 goals for every 60 minutes. To put that in perspective, Jordan Staal was allowing 2.83 goals against for every 60 minutes in 2011-12, his final season with the Penguins. He has played with 13 different wingers this season. He has only two less goals than Jordan Staal in almost 100 less minutes played at even strength and very little power play time. Why did I feel the need to write this post now? Well, it is pretty obvious that Pens fans are completely enamored with the prospect of Ryan Kesler joining the Penguins in the next few days leading up to the trade deadline. Almost every trade scenario sees Brandon Sutter being a trade piece to acquire Kesler and most fans would be fine seeing him go. If you are one of those individuals, I doubt this piece changed your mind. But, I wanted to appreciate Brandon Sutter for what he has done for the Penguins in his time here. While it is easy to forget about him, he has filled his role admirably, and I, for one, would be sad to see him exit Pittsburgh so quickly. You are comparing total salary from this year which is slightly over 2M. Will you be singing the same tune when Sutter wants 4+M next year? He sure isn't worth that. Shero just isn't thinking of this season and this season post run, he's thinking of Sutters new contract and how Kesler at 5M is a WAY better bargain than Sutter at 4+M...They also don't say forwards mature in their late 20's, early 30's. Thats defenseman who do. Forwards mature much earlier. Prime years are 24-27 and if that's all Sutter has to give now, it's very highly unlikely he's going to give much more in the future. Sutter can't take over like Kesler can, he simply can't do what Kesler does. Sure the price for Kesler may be a bit steep but you have to give something to get something. I don't think any 3rd line center should make $5 mil. No, if Sutter commands $4 mil this offseason, I wouldn't re-sign him. I'd look for a 3rd line center in free agency. 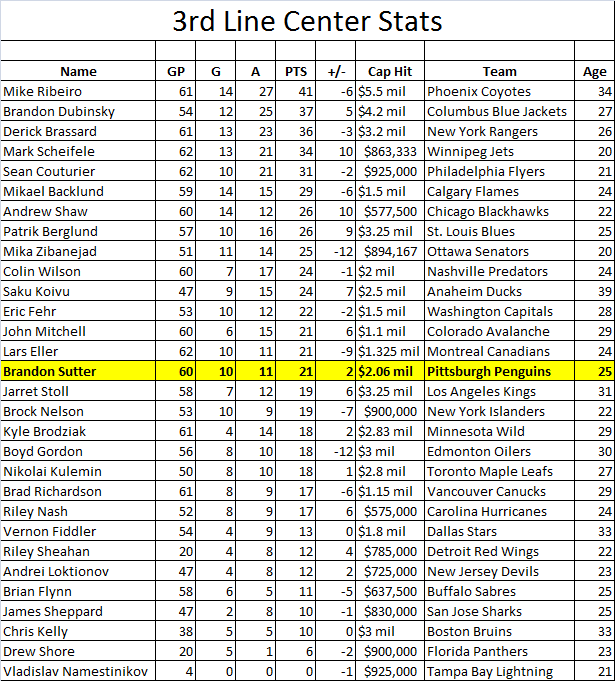 If you believe that forwards prime years are 24-27, then we should definitely pass on Kesler since he is 29. Kesler is a great player, but does not fit on this team the way it is currently constructed. Either way, fans shouldn't be so eager to see Sutter go. He's done a lot with a little, especially this year. If Brandon resigns with the Pens, I would think his multi-year contract would average out to about 3.5 million per year.